Ozone is a powerful oxidizing agent that can be used to destroy the organic compounds that affect the taste and odor of potable water. Environmental concerns have led to increased use of ozone because, unlike chlorine, it does not form hazardous by-products. Ozone is a powerful oxidant. 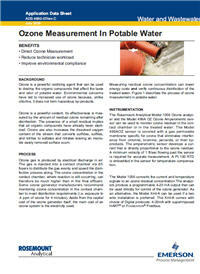 Its effectiveness is measured by the amount of residual ozone remaining after disinfection. The presence of a small residual implies that all organic compounds have already been sterilized. Ozone use also increases the dissolved oxygen content of the stream that converts sulfides, sulfites, and nitrites to sulfates and nitrates leaving an insoluble easily removed surface scum. Ozone gas is produced by electrical discharge in air. The gas is injected into a contact chamber via diffusers to distribute the gas evenly and speed the disinfection process along. The ozone concentration in the contact chamber, where reaction is still occurring, can therefore be much higher than in the final effluent. Some ozone generator manufacturers recommend monitoring ozone concentration in the contact chamber to meet disinfection requirements (i.e. exposure to .4 ppm of ozone for 4 minutes). Aside from the capital cost of the ozone generator itself, the main cost of an ozone system is the electricity used.